Seal your pastries and pasta shut firmly and neatly with the greatest of ease, using this rolling crimping wheel. Make your own delicious ravioli at home. Use Norpro's Ravioli Maker with Press to make up to 12 raviolis at a time, measuring 1.5 inches unfilled and 1 inch filled. Package includes easy to follow recipes for pasta dough and meat filled ravioli. 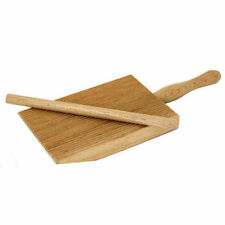 FOX RUN PASTRY DOUGH CRIMPER – 7” LENGTH - Use for Ravioli, Pies, Turnovers and More. Ravioli Pasta Edger Sealer Cutter Wheel –Also for Turnovers & Pies. 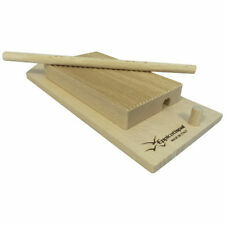 Easily slice into and cut your pastry dough with the pastry wheel crimper from Fox Run. They require work, but this tool makes it easier. Made in Italy of beechwood. They will be ready when they float to the top. They are closely kin to "pot stickers," "pierogies," and other similar dumplings found in many cultures. 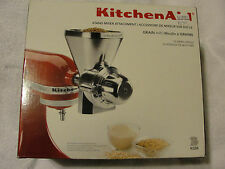 For making the dough: Sift the flour with the salt onto a smooth clean surface. Jumbo Ravioli Maker and Press. This is ‘next-level’ ravioli that will have your family bragging about your cooking to the whole neighborhood. You might want to make extra. A revival of the original, old-fashioned Italian pasta dumpling maker. Use the potato recipe to make great. Fluted edge for authentic ravioli. Model 43220. Make your own Gnocchi. We will help out with any information you may need. (except Puerto Rico). You may also be interested in. Villaware No. 5400. This is a great tool for making Ravioli, a family favorite. Each cavity cuts a 1-3/4" square noodle. Square Classic Ravioli Maker. The tray is 12" long X 4" wide. 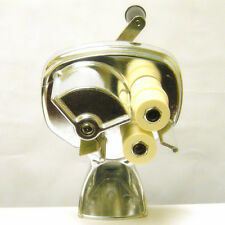 You are bidding on a pre-owned Brevettato Autimatic Ravioli Maker Cast Aluminum Made in Italy. (pictured). It makes 12 raviolis at once. Easy to use. Pattern:Piece: 1 Automatic ravioli maker. Simply roll out dough and place one sheet over the perogie maker. Place filling in the pockets and then cover with another sheet of dough. Now just roll over firmly with a rolling pin, and all the perogies are cut, sealed, and shaped in one go! Crimp and seal pies, turnovers, ravioli and tarts by rolling around edges of dough. The length of the blade - 10cm. THIS LOT FOR. Big Pierogi / Perogie Maker Hunky Bills Ravioli Wonton NEW 1983 w/Instructions. Condition is New. Worn bag due to age. Use your own dough recipe, pre-made pastry or pizza dough. Cut, fill, seal and bake sweet or savory pies. The traditional-style Italian spaghetti rolling pin for artisanal pasta making is crafted from durable beechwood. An a uthentic Italian pasta artisan item 100% made in Italy. This handy rolling pin quickly cuts sheets of fresh pasta dough into spaghetti. Use these Ravioli cutters from Fox Run to easily make delicious, homemade ravioli. 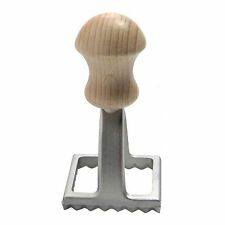 Set of 2; each 2-1/2-inch stamp is made of sturdy and long lasting metal with a comfortable and attractive wood handle. They can also double as cookie cutters. 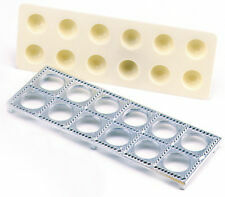 Perfect for cutting and sealing homemade meat, cheese or spinach filled raviolis. Early on, Kuchenprofi realized the need for affordable functional tools that make the kitchen more efficient and more enjoyable. Kuchenprofi made for professionals, now available to anyone passionate about cooking. The traditional-style Italian fettuccine rolling pin for artisanal pasta making is crafted from durable beechwood. An a uthentic Italian pasta artisan item 100% made in Italy. This handy rolling pin quickly cuts sheets of fresh pasta dough into fettuccine—flat, wide noodles that are the perfect carrier for your favorite sauces. Note : the blue " feet" are no longer offered with this product . The tofu press easily presses out excess liquid from your tofu . Using the one center compression handle . Springs eliminate the need for manually separating press plates. Will accommodate the most common size commercial Tofu blocks . The press is 6.75" x 3.93 inches and stands 6.31 inches ( with handle fully retracted ) The plates are made of HDPE food grade plastics . & Thin Spaghetti, Lasagna, Flat Egg Noodles, & Macaroni. Includes 5 Different Plates. Makes Thick. The traditional-style Italian pappardelle rolling pin for artisanal pasta making is crafted from durable beechwood. An a uthentic Italian pasta artisan item 100% made in Italy. This handy rolling pin quickly cuts sheets of fresh pasta dough into Pappardelle — large, flat, wide noodles that are the perfect carrier for your favorite sauces. Fox Run number 57670. They can also double as cookie cutters. We carry a wide range of dinnerware, flatware, glassware and serving pieces as well as cards, collectibles, jewelry, etc. An a uthentic Italian pasta artisan item 100% made in Italy. Authentic Italian pasta artisan item. Pierogies / dumpling / uszka / vareniky press. You can make four pierogies at once. pierogies size 2.75 in x 1.5 in. Place a layer of dough onto pierogie maker, add fillings, close pierogi maker and apply pressure,remove excess dough, open the press. A revival of the original, old-fashioned Italian pasta dumpling maker. Makes them large or small. Cheftor uses a high-quality stainless steel fluted cutter. necessary for many pasta and pastry dishes. wheel and features a ergonomic wooden handle. The stainless steel fluted cutter wheel provides preciseruffled edge cuts which are. Turn the pastry over and seal again. Comfortable anti-slip handle. The ridged base of the stamp will seal each shape while forming decorative crimped edges. Made of aluminum and beech wood. Made of aluminum and beech wood. Ridged base of the stamp seals each shape while forming decorative crimped edges. 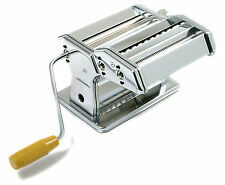 Food-grade-aluminum ravioli maker with 24 cavities; includes wooden rolling pin with 5-7/8" barrel; made in Italy. Cavities 24. NSF Listed Yes. 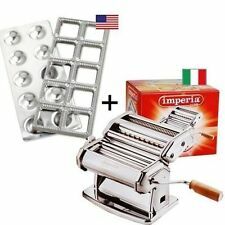 WHATS INCLUDED: PASTA MACHINE. WE WILL WORK TO RESOLVE ANY ISSUES YOU HAVE. 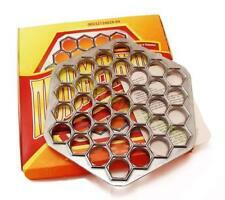 Knock yourself out with this fabulous Ravioli Kit from Mastrad. The kit includes everything you need to make all types and shapes and sizes of mini pies and ravioli: round, square, triangular, and half-moons. Simply lay a sheet of fresh pasta over the form, fill with your choice of filling, top with another sheet of dough, and top with the other side of the form. 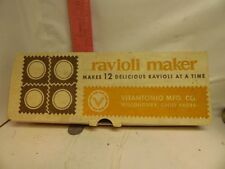 Jumbo Ravioli Maker by Fox Run Details. Contrast the widths of all three by thespace between the ridges of the Eppicotispai rolling pins for cutting those pastas The spaghetti and fettuccine pins are part of the Eppicotispai 9-piece Pasta Starter Set. Where others see utensils, Chef'n sees potential. The machine creates a pocket that’s easy to fill with your favorite ingredients, then seals the pocket for you. The Pocket Machine works with puff pastry, pizza dough and gyoza wrappers to make turnovers, pizza bites, pot stickers and more. Makes six 3-1/2 inch x 1-3/4 inch crescent-shaped pierogies or ravioli at one time. Soft non-scratch and non-slip feet. Made of cast aluminum, with overall measurements 3-3/4 inch x 10-1/4 inch. Please note, customs and duty taxes are the responsibility of the consignee and are not included in the shipping cost. Cell phone & iPad cover case. vehicle & car parts. Engraving Machine. Computers/Tablets & Networking. BGA Accessory. Cell Phones & Accessories. Repair Tools & Machine. Fluted edge for authentic ravioli. Model 43219.